The pounds seem to be coming off more slowly ... but they are coming off. Above is my chart in my Excel tracking sheet. 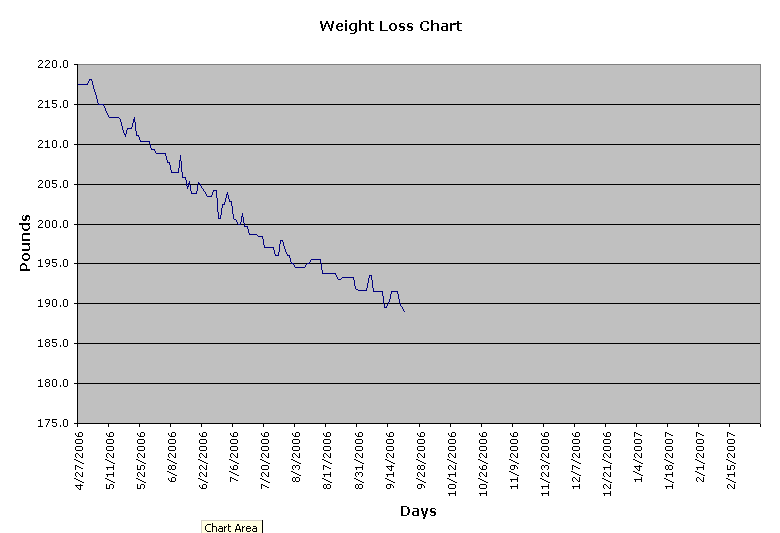 I figure this serves as a good visual of my progress. Interestingly enough, though, is I haven't been ingesting any walnut oil this week. In fact, I've only played basketball on Tuesday and Thursday (today), but have not worked out on the other days. Residual effects? Who knows. 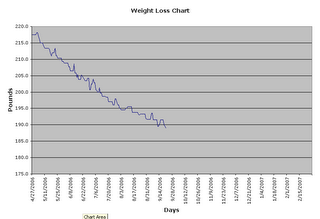 The bottom line is that I'm less than 4 pounds from reaching my goal. I weighed in this morning ... same time of day, same scale with just the towel. Another noteworthy item besides the fact that I've not taken any walnut oil this week, but on two days this week, I ate a bagel and two donuts. One morning someone had Einstein bagels in his office. I love those bagels. So I ate one. Yesterday morning, our company kicked off its United Way campaign. As part of the kick off, they had Krispy Kreme donuts in the lobby. I ate two. My dirtly little secret about losing my weight (or so I thought) is the fact that I've dropped breakfast from my lineup of daily meals. Before the diet, I would eat a packet of oatmeal every morning. But now that I've eaten a light breakfast in place of the WO has me a little suprised. Anyway ... I'm just happy that I'm in good physical condition, that I can play basketball, bike for 30 minutes, run for 30 minutes, swim 15 laps and that I'm losing weight and seem to be keeping it off.